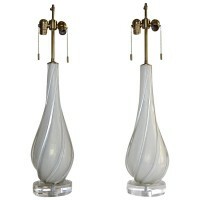 Exceptional pair of Murano hand blown swirl glass lamps in white and subtle gold overlay. Newly wired on custom acrylic bases, brass fittings and with double sockets and French style twisted rayon covered cords. Overall height to top of socket is 32″, glass portion height is 20.5″. Each lamp used 2 – 60 watt max “A” base bulbs.